I got a very pretty Chaos in the mail today, courtesy of Lulubell toys, who had this exclusive Chaos and his matching new Chaos Bea for sale at Wondercon last weekend. 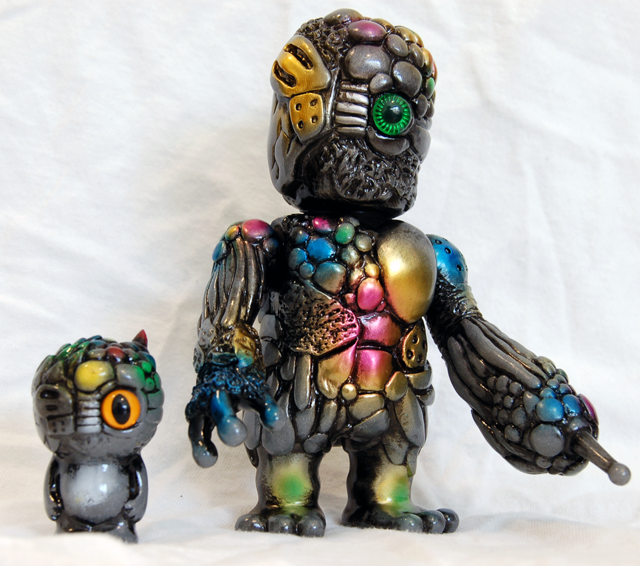 These guys are on pearly grey vinyl with a really clean black rub,a nd a bunch of colorful metallic sprays. They have immediately jumped up into being one of my favorite Real X Head releases! Yeah, the glitter is hard to capture, but this pair is really gorgeous in person. The sprays on the big guy are all metallic, except for the green, and they are great. The Bean is all gloss colors, but not metallic… maybe Chaoses get more shiny as they grow up? 😛 These two are really fantastic, and have immediately become some of my favorite RxH! the pearl effect is on the large Chaos. And then RealxHead added metallic paint!